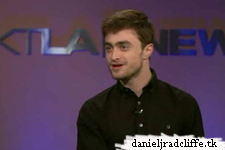 Daniel did visit KTLA 5's Morning News in Los Angeles today to promote Kill Your Darlings. They posted a photo on Twitter. His new role in, ‘Kill Your Darlings’, will keep you on the edge of your seat.